Gardens by the Bay is a nature park spanning 101 hectares (250 acres) of reclaimed land in the Central Region of Singapore, adjacent to the Marina Reservoir. The park consists of three waterfront gardens: Bay South Garden (in Marina South), Bay East Garden (in Marina East) and Bay Central Garden (in Downtown Core and Kallang). The largest of the gardens is Bay South Garden at 54 hectares (130 acres). Its Flower Dome is the largest glass greenhouse in the world. Gardens by the Bay is part of the nation’s plans to transform its “Garden City” to a “City in a Garden”, with the aim of raising the quality of life by enhancing greenery and flora in the city. First announced by the Prime Minister, Lee Hsien Loong, at the National Day Rally in 2005, Gardens by the Bay was intended to be Singapore’s premier urban outdoor recreation space, and a national icon. Being one of the popular tourist attractions in Singapore, the park received 6.4 million visitors in 2014, while topping its 20 millionth visitor mark in November 2015. 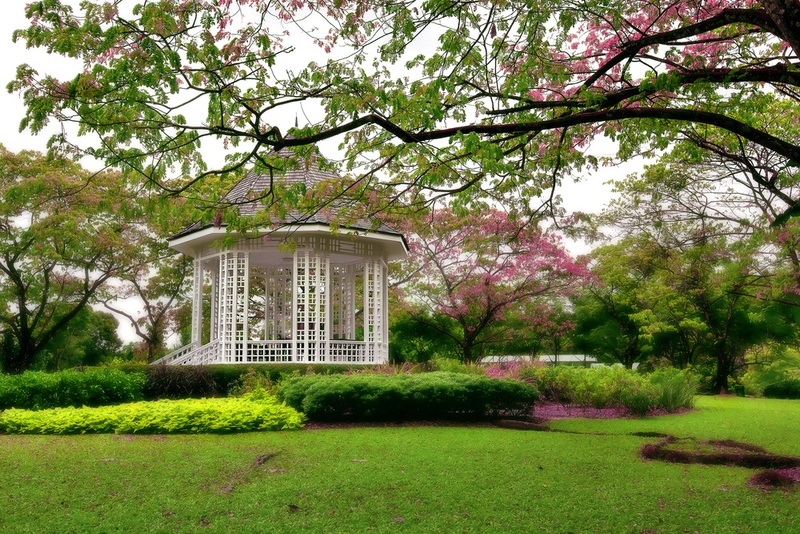 The Singapore Botanic Gardens is a 158-year-old tropical garden located at the fringe of Singapore’s Orchard Road shopping district. It is one of three gardens, and the only tropical garden, to be honoured as a UNESCO World Heritage Site. The Botanic Gardens has been ranked Asia’s top park attraction since 2013, by TripAdvisor Travellers’ Choice Awards. It was declared the inaugural Garden of the Year, International Garden Tourism Awards in 2012, and received Michelin’s three-star rating in 2008. The Botanic Gardens was founded at its present site in 1859 by an agri-horticultural society. It played a pivotal role in the region’s rubber trade boom in the early twentieth century, when its first scientific director Henry Nicholas Ridley, headed research into the plant’s cultivation. By perfecting the technique of rubber extraction, still in use today, and promoting its economic value to planters in the region, rubber output expanded rapidly. At its height in the 1920s, the Malayan peninsula cornered half of the global latex production. Marina Bay Sands is an integrated resort fronting Marina Bay in Singapore, owned by the Las Vegas Sands corporation. At its opening in 2010, it was billed as the world’s most expensive standalone casino property at S$8 billion, including the land cost. The resort, designed by Moshe Safdie, includes a 2,561-room hotel, a 120,000-square-metre (1,300,000 sq ft) convention-exhibition centre, the 74,000-square-metre (800,000 sq ft) The Shoppes at Marina Bay Sands mall, a museum, two large theatres, “celebrity chef” restaurants, two floating Crystal Pavilions, art-science exhibits, and the world’s largest atrium casino with 500 tables and 1,600 slot machines. The complex is topped by a 340-metre-long (1,120 ft) SkyPark with a capacity of 3,900 people and a 150 m (490 ft) infinity swimming pool, set on top of the world’s largest public cantilevered platform, which overhangs the north tower by 67 m (220 ft). The 20-hectare resort was designed by Moshe Safdie architects. Chinatown is a subzone and ethnic enclave located within the Outram district in the Central Area of Singapore. Featuring distinctly Chinese cultural elements, Chinatown has had a historically concentrated ethnic Chinese population. As the largest ethnic group in Singapore is Chinese, Chinatown is considerably less of an enclave than it once was. However, the precinct does retain significant historical and cultural significance. Large sections of it have been declared national heritage sites officially designated for conservation by the Urban Redevelopment Authority. The Singapore Zoo, formerly known as the Singapore Zoological Gardens and commonly known locally as the Mandai Zoo, occupies 28 hectares (69 acres) on the margins of Upper Seletar Reservoir within Singapore’s heavily forested central catchment area. The zoo was built at a cost of $9 million granted by the government of Singapore and opened on 27 June 1973. It is operated by Wildlife Reserves Singapore, who also manage the neighbouring Night Safari, River Safari and the Jurong Bird Park. 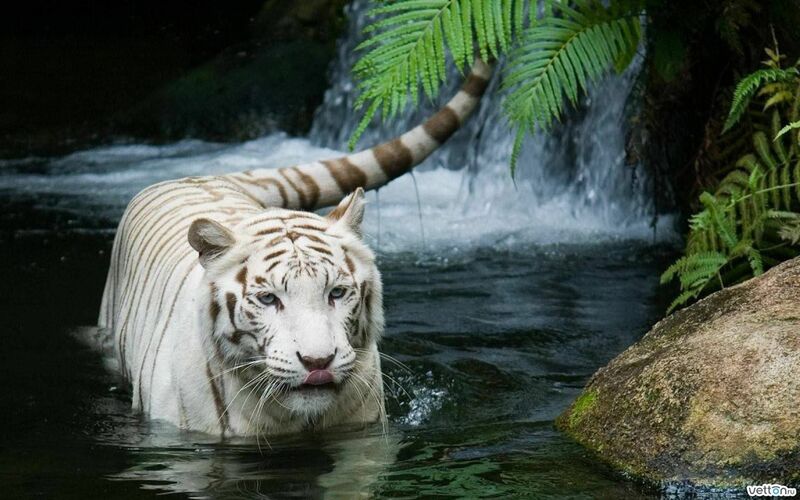 There are about 315 species of animal in the zoo, of which some 16 percent are considered to be threatened species. The zoo attracts 1.7 million visitors each year. From the beginning, Singapore Zoo followed the modern trend of displaying animals in naturalistic, ‘open’ exhibits with hidden barriers, moats, and glass between the animals and visitors. It houses the largest captive colony of orangutans in the world. Orchard Road is a 2.2 kilometre-long major road in the Central Area of Singapore. Often known colloquially as Orchard, the area is a major shopping belt and tourist attraction. The Orchard Planning Area is a planning area as specified by the Urban Redevelopment Authority. It is part of the Central Area located within the Central Region. Orchard is bordered by Newton in the east and north, Tanglin in the west, River Valley in the south and Museum to the southeast. Sentosa, previously called Pulau Blakang Mati, is a resort island in Singapore. It was once a British military base and a Japanese prisoner-of-war camp, and many Chinese were found killed on its beach during the Japanese occupation. 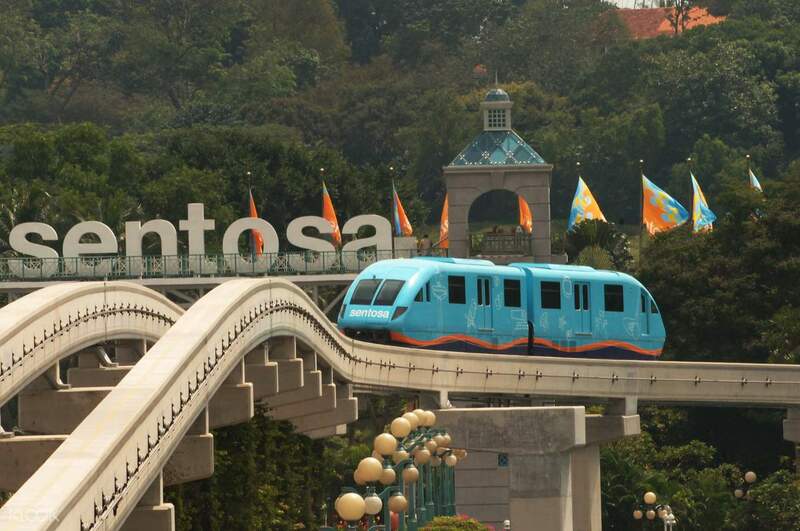 The island was renamed Sentosa and turned into a tourist destination in 1972, and it is now home to a popular resort that receives some twenty million visitors per year. 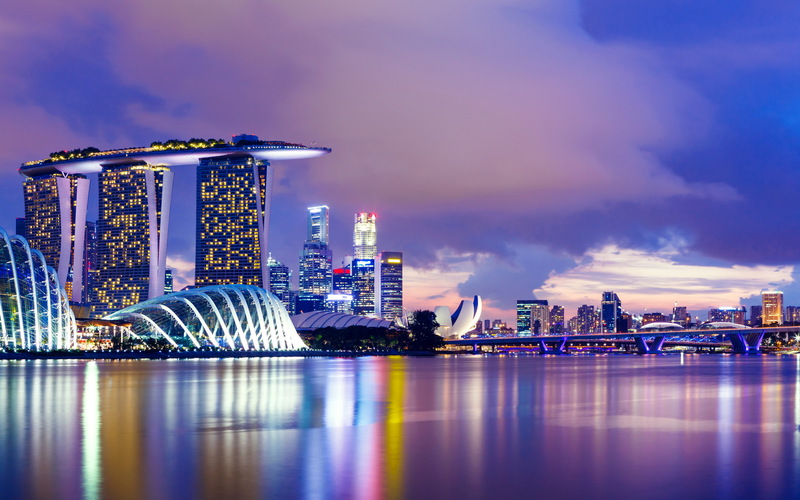 Attractions include a 2 km (1.2 mi) long sheltered beach, Fort Siloso, two golf courses, the Merlion, 14 hotels, and the Resorts World Sentosa, featuring the theme park Universal Studios Singapore and one of Singapore’s two casinos. The Flyer has an overall height of 165 metres (541 ft) and was the world’s tallest Ferris wheel until the 167.6 m (550 ft) High Roller, which is 2.6 m (9 ft) taller than the Flyer, opened on the Las Vegas Strip in Nevada, US, on 31 March 2014. The previous record holder, the Star of Nanchang, in Jiangxi, China, is 160 m (525 ft) tall, although its 153 m (502 ft) diameter wheel is larger than the Flyer’s 150 m (492 ft) wheel. Little India is an ethnic district in Singapore. 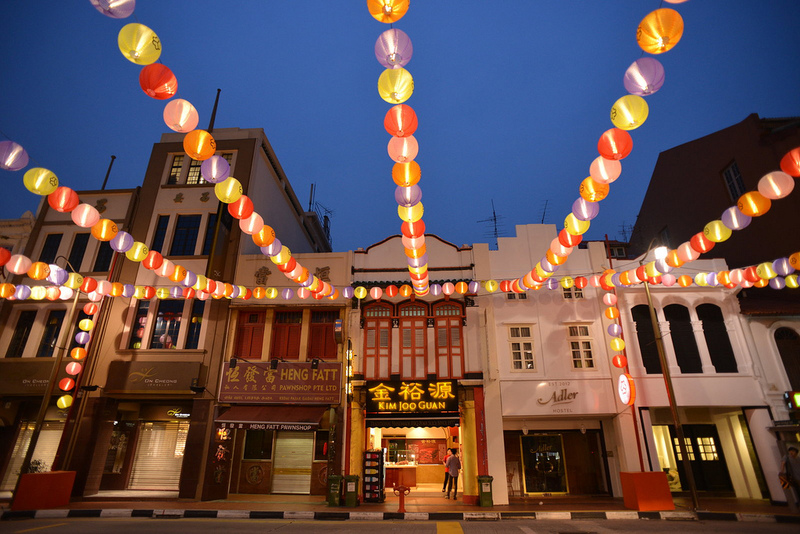 It is located east of the Singapore River—across from Chinatown, located west of the river—and north of Kampong Glam. Both areas are part of the urban planning area of Rochor. Little India is commonly known as Tekka in the Indian Singaporean community. The Asian Civilisations Museum (ACM) is an institution which forms a part of the four museums in Singapore, the other three being the Peranakan Museum at Old Tao Nan School, the National Museum of Singapore and the Singapore Art Museum. It is one of the pioneering museums in the region to specialise in pan-Asian cultures and civilisations. The museum specialises in the material history of China, Southeast Asia, South Asia and West Asia, from which the diverse ethnic groups of Singapore trace their ancestry.